I'm afraid I will sound like a broken record if I keep talking about my love of a beautiful overcoat. My Mango one was getting so much use, I thought a new coat would do my closet well. Instead of a basic neutral, a pale blue color elevates any outfit. I purchased a turtleneck from The Reformation and cannot wait to wear it underneath this coat for a monotone outfit. Love those rings! I always paint my nails white in the summer and I never thought it would work in the winter, but I love it! Thank you Caroline- I love wearing white polish all year round- it's so fresh and different. I love this! Ever since I saw that blue coat on Blake Lively in Lucky, I knew it would be a trend. It's a nice update to the classic coat colors. You've inspired me to add more blue into my wardrobe! new plan: steal your entire coat collection. just kidding. but seriously it's amazing, Sloane. Love this look! Love the way you styled those rings! I've been hesitant to try midi rings but now I think I must! You should Fran! Thanks for stopping by. And your rings looks awesome! 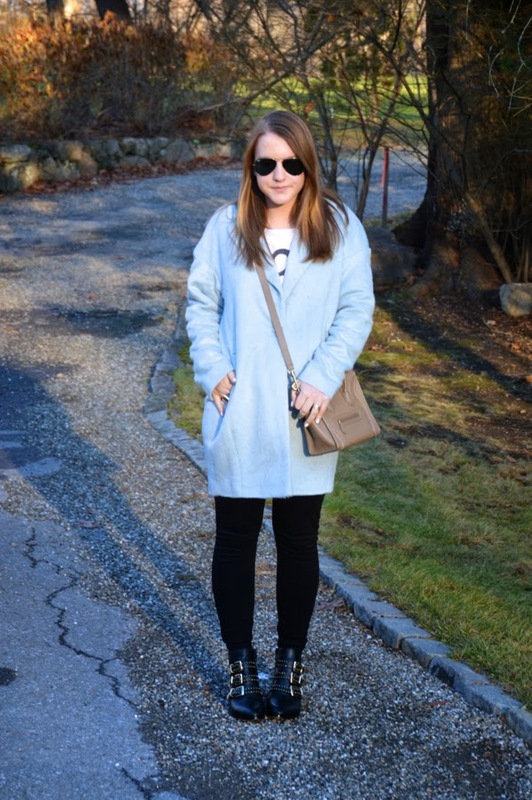 I love the coat + the neutral bag + the booties! It works so well together!